THE CACHE IS NOT AT THE PUBLISHED COORDINATES MATEY! To locate The Pirate Treasure Cove you must first search and find four famous Pirate ships hiding off the barbary coast of the Spanish Main. Each of these Pirate ships contain a secret map with partial coordinates which you must locate and figure out the coordinates to The Pirate's Treasure Cove! Come aboard and set sail to Pirate's Treasure Cove... the legendary hideaway of thieving pirates and cutthroat buccaneers. The tales of those legendary pirates of old who've fought and survived these mysterious waters still haunt all those who yearn for a life at sea. You must be armed with the secret maps and start with a modestly outfitted sloop salvaged from last winter's storm, you set sail to seek Pirate's Treasure Cove - your eyes filled with visions of treasure and fame, your lungs filled with the salty air of the High Seas. Your objective: Locate and plunder four (4)famous Pirate ships: The Whydah Galley, The Royal Fortune Sloop, The Adventure Galley, and The Queens Anne's Revenge , and locate the hidden maps, battle the most famed and feared Pirate the world has ever seen. You will need to navigate shrewdly, fight recklessly and pillage mercilessly on your high sea adventure. 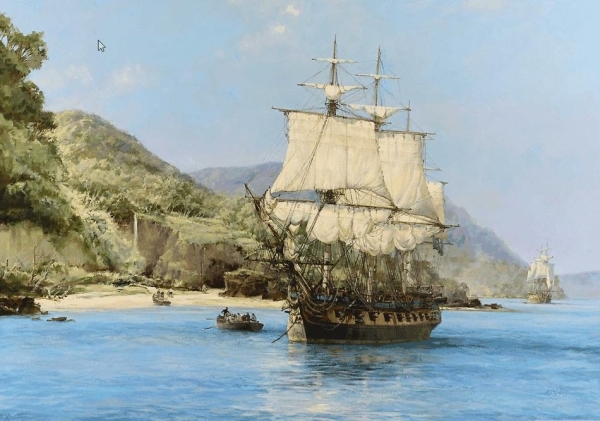 The Golden Age of Piracy came about soon after the discovery of the New World and continued for about 250 years. When the Pope divided the New World between Spain and Portugal in 1494 the other European nations were not very happy. They wanted some of the stolen Aztec gold also. War was a given. The New World coast from South America through the Caribbean to Northern Florida was known as "The Spanish Main". In 1630 a treaty was signed with Spain enabling the English and French to colonize some of the lands along the Spanish Main. One of the main sources of food the settlers consumed on the island of Hispanola were the wild pigs originally introduced by the Spanish. The pigs were barbecued on open fires called buccans or boucan. This is how the settlers got the title buccaneers. The Spanish were getting a little nervous because of all the buccaneers on Hispaniola. They sent hunters to kill all the pigs which in turn made the buccaneers turn to piracy because their food source was gone. Later Spain realized they made a dire mistake. Many of the buccaneers (they called themselves Brethren of the Coast) moved on to a new island named Tortuga/Turtle. It is located off the coast on the Haitian side of the island. This island became a sanctuary for the Buccaneers because of its perfect habitat and location. Please note to pick up a trail map at the Education Center. Please use the trails wisely, a direct route is not the best route. Please follow the winding trails and boardwalks for limited bushwhacking. The scenic Lord Sterling park offers 8 1/2 miles of Nice hiking trails, with more then 3 miles of boardwalks. Bordering the Great Swamp National wildlife Refuge and the Passaic river, parts of this area is prone to flooding. While hiking ofter rain it is recommended to wear boots, as trails can be muddy. *IMPORTANT* Please bring DEET and protect yourself during the warmer months from mosquitoes and ticks which are abundant protecting these Pirate swampy hideouts!. Gur fxhyy naq pebffobarf ubyq gur gernfher!